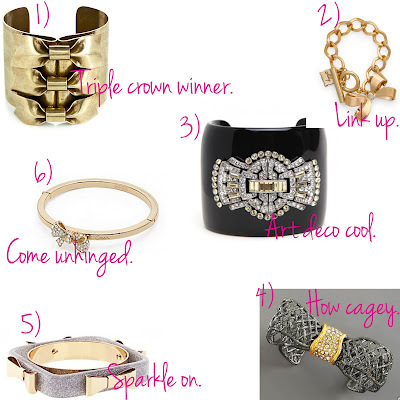 At once cute and cool, bow bracelets are the newest trend I'm excited about. And whether you want a cuff or a bracelet, one more delicate or one more rock 'n roll, there's one out there. Below, the six best. Three stacked bows and a cuff of burnished brass mean this is one that has three times as much to love. Oversized links meet a bow charm and toggle closure -- and look so pretty encircling the wrist. Old Hollywood, Art Deco and a tough edge make this cuff so unbelievably cool. Opulent Swarovski crystals accent a gold knot that encircles a cage-like bow, creating a cuff that's unbelievably intricate and beautiful. Glitz, glamour and just a touch of the delicate. From the crystal-inlaid bow to the slender infinity silhouette, this is a bangle worth wearing forever.